Following the great tank battles in North Africa and the Eastern Front in 1942-43, the German panzers were outnumbered on all fronts, and production of tanks was lagging due to air attacks on Germany. German designers came up with the concept of creating inexpensive, easily maintained tank destroyers based on existing AFV chassis. Without the complex turret, these vehicles were easier to produce. In December 1943, the BMM factory in Prague was given the assignment of creating a “jagdpanzer” based on the proven Pz.38(t)chassis. This prewar Czech light tank was one of the best AFVs produced in Europe prewar and had been impressed into the German Army following the Nazi takeover of Czechoslovakia when the Germans saw how superior it was to what they were producing at the time. The chassis was used for several other successful developments, including the Sd.Kfz. 138 Marder III. The new vehicle, designated the Sd.Kfz. 138/2, Jagdpanzer 38 Hetzer, had a fully enclosed crew compartment and was armed with s Pak 39 L48 75mm cannon, mounted offset to the right of the vehicle centerline. Road trials of the first three prototypes began in April 1944, along with assembly of a pre-production batch of 20. The new vehicle was demonstrated for Hitler on his birthday, April 20, 1944, and was ordered into production, with 50 produced in May, and the program was accorded absolute priority in June 1944 following the Allied invasion of France. Skoda followed BMM in full-scale production in July 1944. The definitive “late production” Hetzer started coming off the production lines at the beginning of September 1944. The first unit to take the Hetzer into combat was Panzer Jaeger Abteilung 731, which fought in the Warsaw Uprising in August 1944. Allied units first met Hetzers during the fighting for the Arnhem bridgehead that September. Hetzers were also used in the battle of the Huertgen Forest in October-November 1944, and took part in the Ardennes Offensive - known to the Allies as The Battle of the Bulge - in December. They were widely used in the fighting in Poland, Hungary, Czechoslovakia and the final fighting in Germany. By the end of 1944, 1,507 Hetzers had been produced. The best month of production came in January, with 468 Hetzers delivered. Another 1,246 Hetzers were delivered before production ceased following the Allied bombing of BMM on March 25, 1945 and Skoda on April 25. The end of the war was not the end of the Hetzer. The Skoda factory resumed production, and the Hetzer entered the inventory of the new Czech Army, with which they would serve until the mid-1950s as the ST-1. Purchased in 1950 for the Swiss Army as the Pzj.G-13, the Hetzer finally left first-line service there in the mid-1970s. 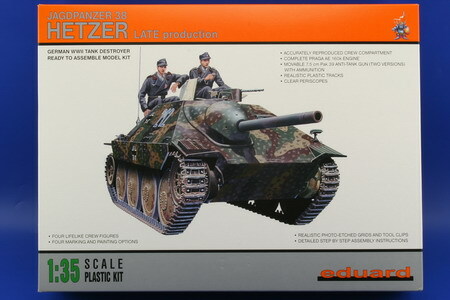 Eduard’s Hetzer series marks the company’s first expansion of their line of kits to include original armor, and is intended to compete with the “big boys” in terms of detail and state-of-the-art design and production quality. 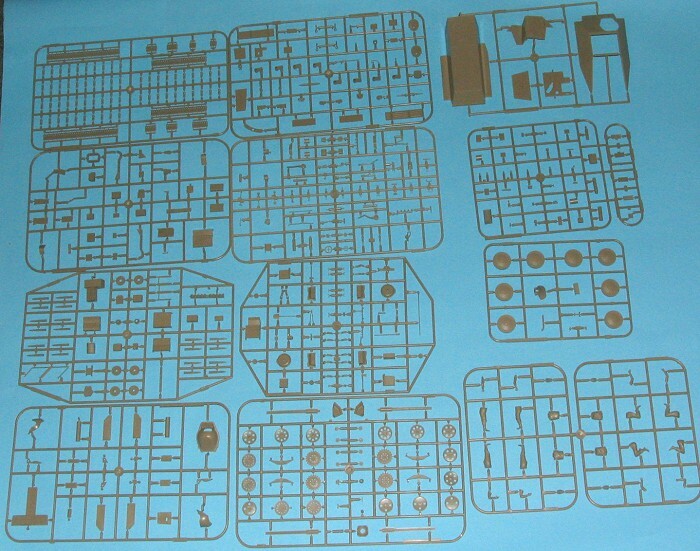 This late-production Hetzer version comes in a big box that is full of sprues of cleanly-molded light brown plastic when you open it up. The very complete kit includes a fully-detailed engine, a fully detailed Pak 39 L48 75mm cannon, and a very complete crew compartment. Unfortunately, all this really nice detail will be invisible if you only open up the small hatches, so one hopes there is some way to display the completed model opened-up to show all this. In fact, in the instruction booklet, notice is made that Eduard had access to thoroughly studying two Hetzers in the Lesany Armor Museum of the Czech Army, as well as to “help and guidance” from the Historical Branch of the Army of the Czech Republic. Additionally, they were able to study a privately-owned Pzj.G-13, and were provided research material by Vladimir Francev, a recognized authority on the Hetzer. Others may disagree, but in my book “going to the original physical source” beats “measuring up to the drawings” any day of the week and twice on Sunday. This is an interesting-looking kit of one of the major German AFVs of the final year of the war. Eduard is rapidly proving themselves the Tamiya of Eastern Europe in terms of putting out well-designed, well-produced kits of interesting subjects (and may even be ahead of the Japanese now, given Tamiya’s apparent lack of interest in producing new subject-matter kits). This little creepie-crawlie definitely interests this airplane modeler.